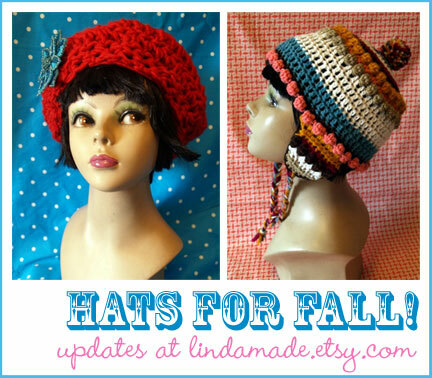 I added several hats to my etsy shop today- some older ones are on sale, and then there are a whole bunch of new ones that I’ve been spending my time on. I’m especially fond of the birthday cake hats (above right)–they’re so fun to make because of all the bobbles and colors. In other news, check out Diane Gilleand’s latest podcast on the topic of Craft Overload. She interviews several busy crafters (including myself) with some suggestions as to how to prevent craft overload in the first place. Personally, thinking about all of the projects I want to do plus the projects I want to pursue is making me a little dizzy right now. Head over and listen- Diane does a great job editing the shows and I am waiting for the day she’s on NPR. NPR?? Hee hee -- as soon they decide to let me ramble on about crafts all day, I'm there! Thanks so much for being on the podcast, especially while in mid-move and travels. Your insights were so great!
. . . And these hats are adorable.